Welcome to Prepaid Phone News' regular Sunday Prepaid Phones on Sale this Week feature listing the best US prepaid phone deals in one place. 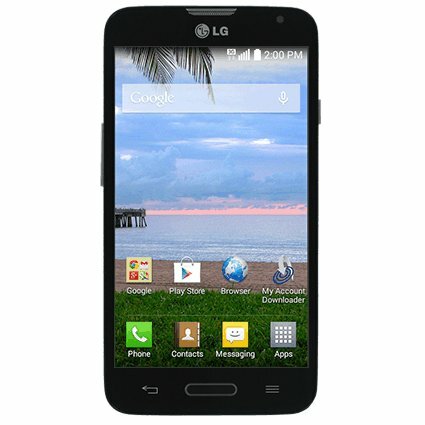 My Deal of the week is the new TracFone LG Ultimate 2 Android phone with 1200 minutes, 1200 /texts, 1200 MB of data and one year of service for $139.12 + $3.22 shipping. The regular price for the phone alone is $129.99 and the airtime and year of service is a $99.99 value so this is a very good deal. The Ultimate 2 runs Android 4.4 KitKat and has a 4.5 inch 480x800px screen, 1.2 Ghz dual core Qualcomm processor, 5 MP camera with autofocus and flash and 8GB of internal memory. There's a memory card slot and a removable battery. The phone uses the Verizon network and it's a"triple-triple" phone which means that a $20, "60 minute" top-up adds 180 minutes, plus 180 texts, plus 180 MBs of data good for 90 days. AT&T Nokia Lumia 635 LTE Windows Phone $79.99 (reg $99.99) at Amazon. Verizon (also works on Page Plus) Nokia Lumia 822 LTE Windows Phone 8 for $94.94 at Amazon (was $329.99). Verizon (also works on Page Plus) Motorola RAZR M for $123.99 brand new from Amazon or $74.99 refurbished from Groupon. Target free shipping on all orders mow through Dec. 20. Tracfone (online only) Free overnight shipping on orders of $19.99 or more (ends 12/19. Not all phones available in all markets. FYI, the Boost Mobile Sharp Aquos Crystal is showing up at ShopCellDeals as $139.99 and not $39.99. Thanks, I've corrected that typo. Thanks for this list every week and the articles! I read every week and you are so helpful! Does anybody know if and where you can get an unlock code for Metropcs Kyocera (Hydro XTRM) models? I see plenty of unlocks for Metropcs LG's but no Kyocera's, thank you. Any thoughts on the best prepaid deal for an unlocked iphone 4s. The phone is for my spouse, she talks quite a bit, does some texting and a little data. I would like to be at $25 to $30 a month. For an IPhone 4s something AT&T based is probably your best bet. See AT&T and AT&T MVNO Prepaid Plans Compared for available options. The Airvoice or H2O $30 plans look like good options for your spouse's use. Can the Verizon "iPhone 4 16 GB (Certified Pre-Owned) $79.99" be used on Page Plus or other Verizon MVNOs? No, Verizon Prepaid phones can't be activated on Verizon MVNOs. The link for the Boost Moto G under Shop Cell Deals shows it for "Sprint Pre-Paid" service? It looks like SCD has run out of the Boost version. Thanks for letting me know.